← Monday Bacon: Practice Makes Perfect…but not really. 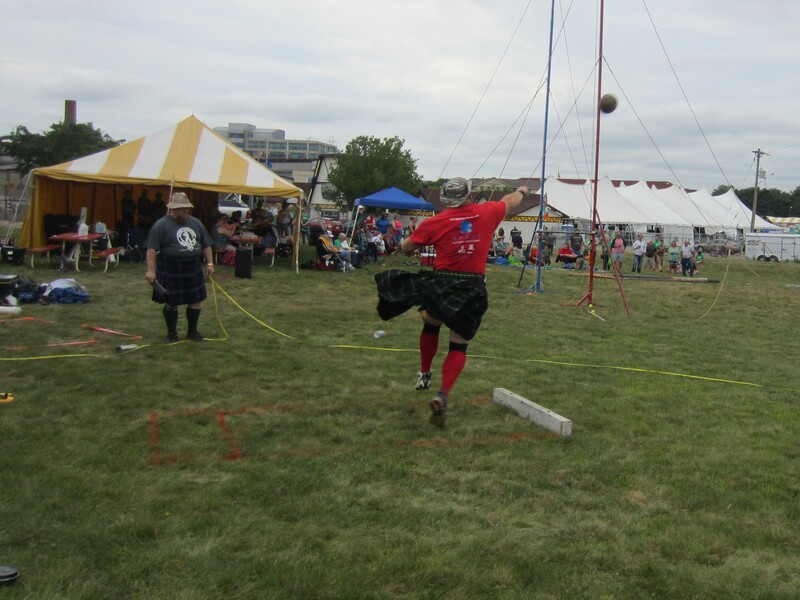 Even though we’ve had some amazing trips revolving around throwing in the Highland Games this season, we really haven’t thrown that often. The last time we threw with our “home team” was in March. Yes. March. Over four months ago. And the last time we had a chance to throw and chill with the fabulous La Crosse crew (we’ll just call them The Crowley’s as Katie will be one soon enough) was last year IN La Crosse! Unacceptable. Well, sure, we’ve had some straggler type meetings here and there. Jason Clevenger is always willing to drag his equipment out to let us come and play and that’s always a treat but getting the band back together on a regular basis just doesn’t happen. Until this past weekend. It’s a sad fact of life that time dims the love and admiration, respect, and simple joy we have for people until we get to spend another day together and then it all washes into the heart in waves. And that’s how it was. Throwing with Katie “almost Crowley” is like going to your favorite class taught by your favorite teacher in High School (without the High School drama.) Her cheery disposition never wavers and her stone throws are magical only they’re not. They’re just spot on mechanics and when she puts them all together, the stones fly. I caught a picture of her just before her hammer release and thought to myself, why can I not figure this out!!! Geez! She makes it look so easy! Also spending the day with Victoria Bunchek, former University of Nebraska Hammer thrower and Topaz Schweska makes for a perfect group of ladies there for some fun and some big throws. Victoria had a gorgeous 16′ WOB pr after coming back from a disappointing Sheaf event and it was spectacular! As for me, the day was a good one. Anytime I go over 60′ for the heavy hammer is a plus. It doesn’t always happen and I’m still very nervous about the event as a whole and tighten up. It’ll come. I know it’ll come. The open stone isn’t what I wanted and I didn’t connect on what I’ve been practicing but it wasn’t a fail either and I have to remind myself not to be so G*D* critical. It’s coming. I had a quick phone tutorial on my distance weights this week from the best and am so thankful to Adrian Wilson for taking some time out of her busy day for me. Though I didn’t get a chance to practice the few position tweaks, I was able to connect on my first HWD and threw a hair over 40 feet. This was probably my biggest thrill of the day. I don’t think I’ll have another opportunity this year to throw the 28# heavy (we throw the 21# in my age group and women’s masters in general) and I really, REALLY wanted to go over 40 this season. The feedback I got was that I hit my positions spot on and she flew. I was pretty excited. My light weight is tougher for me because once I start turning, I can’t feel the weight and have to trust my positions more than feel them. My first throw was 69 foot plus but I flew right out of the trig. Damn. Another foul on my second and I had to be content with a 64′ final throw but ya know what? I would’ve been just fine with that a few months ago so I’ll take it. I know the power is there to go over seventy feet, we’ll just see if I can harness the craziness in to do it. OH! A little wife brag here. Things are clicking for Matt too and he had a gorgeous 38′ plus throw in HIS heavy weight. The awesome part is that he’ll just continue to improve the overall throw but just fixing one thing we’ve been working on has seen huge improvements. I’m incredibly proud of him. 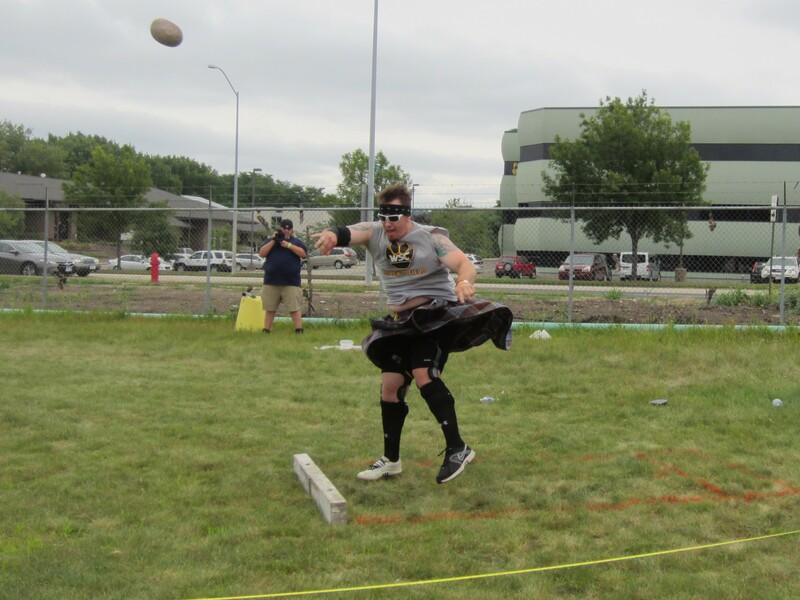 At times, the term “old dog, new tricks” can enter throwing practice for both of us and spending years getting “tight” for lifting or Strongman/Weightlifting competitions work against us. Also, he has an awesome coach. Caber was fine. 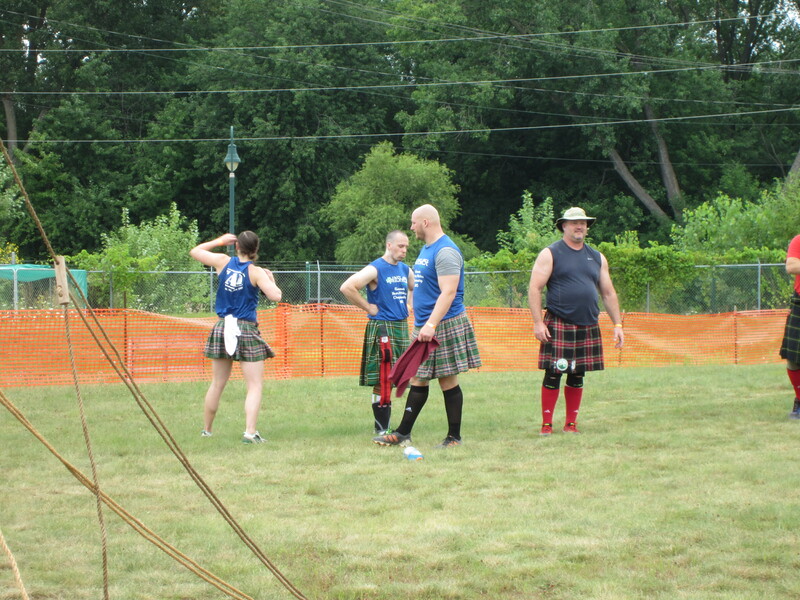 Didn’t turn but I know why and really, out of ALL the athletes (men and women), only Katie turned a Caber. She’s boss. Luke checking out his wife-to-be’s posing skills. But not really;) Well, yes, really he’s checking her out but she’s dialing in her stone positioning. Sheaf was fine, going up in 3′ increments gets in my head but really, it’s coming. Hitting 15′ on the WOB again was another thrill for me and ended the day on a great note. Brian Hare releases a doozie with Jason Clevenger looking on. Ross Bunchek makes this look easy! 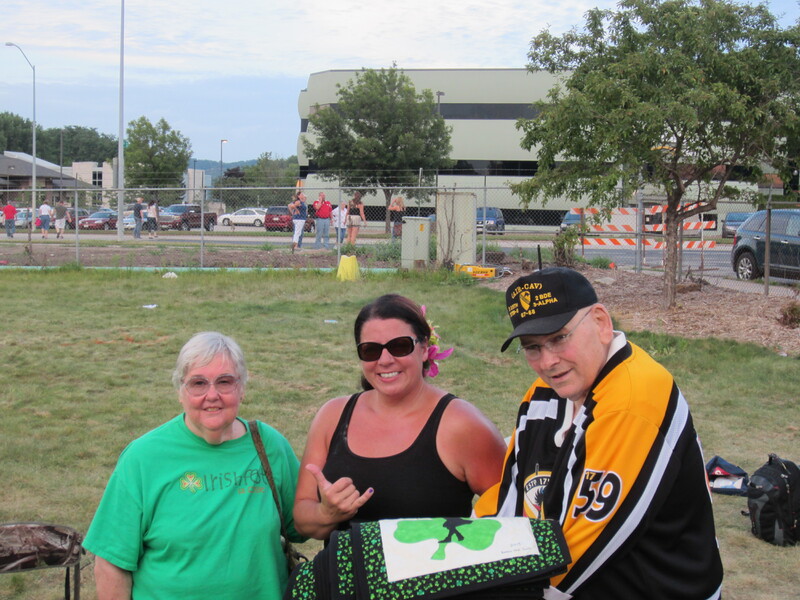 The first picture above is me with Mr. and Mrs. Smith, Terry Smith’s mum and pop. Each year, she quilts these banners for the competitors and it is (understandably) my favorite prize of the year. And that’s saying a lot in a year where I’ve received such fun prizes as an awesome Hawaiian Tiki; Icelandic Skyr, and money. Getting big hugs from Barb Smith is like being enveloped in such goodness and love you don’t want it to end. Bringing home a little piece of her work is so incredibly special. We miss having Terry around at these Games but having his folks there supporting the throwing is very, very special. Another perk is getting to hang out after with not only our throwing friends, but Strongman friend Pete Konradt and his wife Tiffany and if we’re REALLY lucky, their two awesome boys. There were so many silly, fun times in the beer tent while listening to Gaelic Storm and the Red Hot Chilli Pipers that it made me a little teary. That’s the heart overflowing thing I guess. I’ll take it. It’s awesome. I’ve never thrown in an open group like this where everyone is throwing so well and serious about doing so while still having fun. I wish all my Games were like this. Yup. Which is why we cherish our Home Team. Everybody has a home team: It’s the people you call when you get a flat tire or when something terrible happens. It’s the people who, near or far, know everything that’s wrong with you and love you anyways. These are the ones who tell you their secrets, who get themselves a glass of water without asking when they’re at your house. These are the people who cry when you cry. These are your people, your middle-of-the-night, no matter-what people. 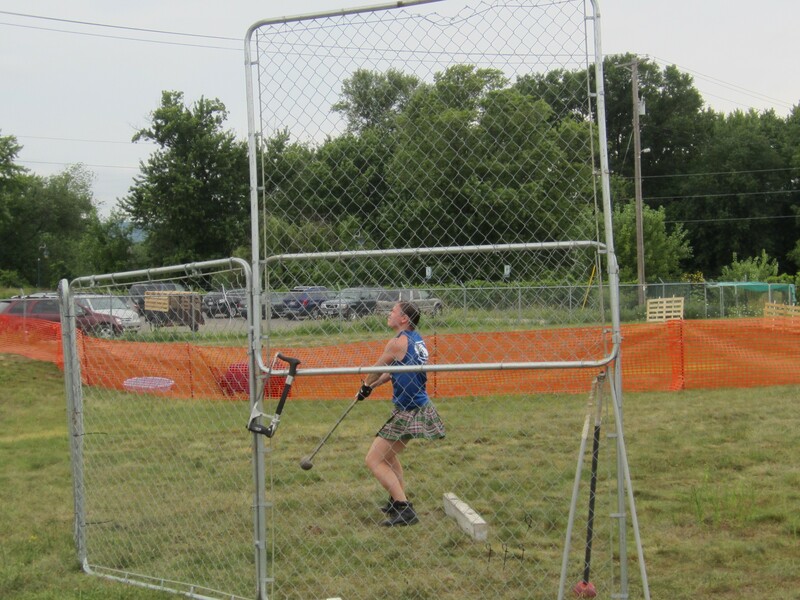 This entry was posted in Uncategorized and tagged Gaelic Storm, Good Friends, Highland Games, La Crosse Irish Festival, Red Hot Chilli Pipers, Thankful. Bookmark the permalink.